There is a postal rate increase scheduled to go into effect on January 22nd, so if you have a box to mail, save yourself a little money and get it in before then! Here’s a link to the USPS page about the increase. Before we get to it, I wanted to shout out a special thanks to Allison G of Allison’s Creations for converting our recent sketches to PDF format! Sketches 1 – 100 are now available as one file that you can download – just click here and save to your computer. Thanks so much, Allison! And here’s our new sketch! Just a reminder – the heart shape indicates the embellishment of your choice, it doesn’t have to be a heart. We have a beautiful sample card this week! Be sure and visit Sue K at her blog Little Bits of Randomness to see more of her awesome work (and some cute puppies!) I love the layered flower embellishments she used here, don’t you? Thanks again for a great sample card, Sue! Hmm, what will you use for the three embellishments? Stars? Hearts? Leaves? Be sure and come back here to link up your blog or online gallery post so we can all see! As usual, Sue, your card is just fabulous. I've come to expect nothing less from you. You are a super talented lady and I love viewing you blog daily. Thank you for being a sample maker for OWH. You will inspire many of ladis to get card making. Thanks Sue for rocking the sketch! Allison, thanks for making the PDF with sketches 76-100 for all of us! Really a helpful, quick guide to use. And Sue, your card is wonderful! I'm so happy to share with everyone the PDF files I created in order to have access to all of the sketches in an easy to store format!Sue, your card is beautiful. Thanks for the inspiration. Gorgeous Card, love the color combinations. Oh how fun love this sketch and all the samples, tfs! Thank you Allison for creating the PDF of all of the sketches! Sue's sample card is gorgeous! Thanks, Allison, for the pdf! What a gorgeous card and such a noble cause! 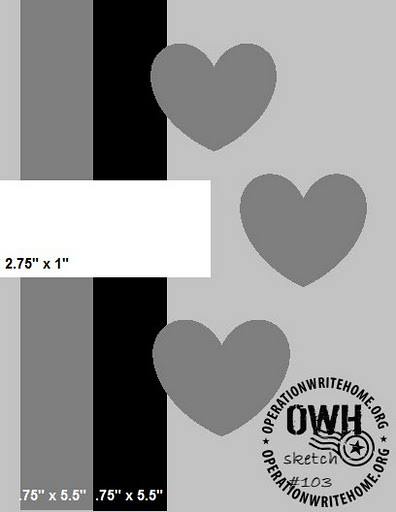 I found out about OWH from Graphic 45's Facebook page … love what you do, and the cards I see on here are all so wonderful! Can't wait to participate!! Wow! Gorgeous sample card and I love all the examples in the thumbnails, great inspiration! This is wonderful inspiration to try the sketch.Thanks to Allison for the handy pdf. I've started using sketch #1 and hope to continue one-a-day through 100, as I know I've missed a bunch. No excuses anymore! Thanks so much for the weekly sketches – certainly helps me on new ideas – and THANK YOU so much Allison for the PDF – will come in handy when looking for ideas!! !